Cornell University - Milstein Hall - Evans Roofing Company, Inc.Evans Roofing Company, Inc.
General Contractor: Welliver Mcguire, Inc.
Cornell University recently completed the Paul Milstein Hall in October 2011, adding another spectacular addition to the College of Architecture, Art and Planning (AAP). This building unites the second floors of Rand and Sibley Halls while preserving an open landscape beneath. This design created a much needed flexible contiguous studio space, a 260-seat auditorium, meeting and exhibition space, and a college forum – a signature gallery for collaboration and exhibition that showcases student and faculty work. Milstein Hall unifies the colleges existing programs, now housed in four separate buildings promoting and fostering new and innovative ways of teaching. 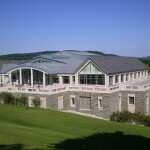 This unique design skillfully creates a central arrival and gathering space for the college within the historic context of the site and the adjacent Arts Quad. In 2008, the university mandated a 30% reduction in energy costs and silver LEED certification in all new construction projects costing more than $5 million. Milstein Halls 47,000 square feet weaves its definitively contemporary architecture throughout the college’s historic buildings, creating a dynamic landscape. The Milstein Hall exterior materials and finishes are expressive of its construction. 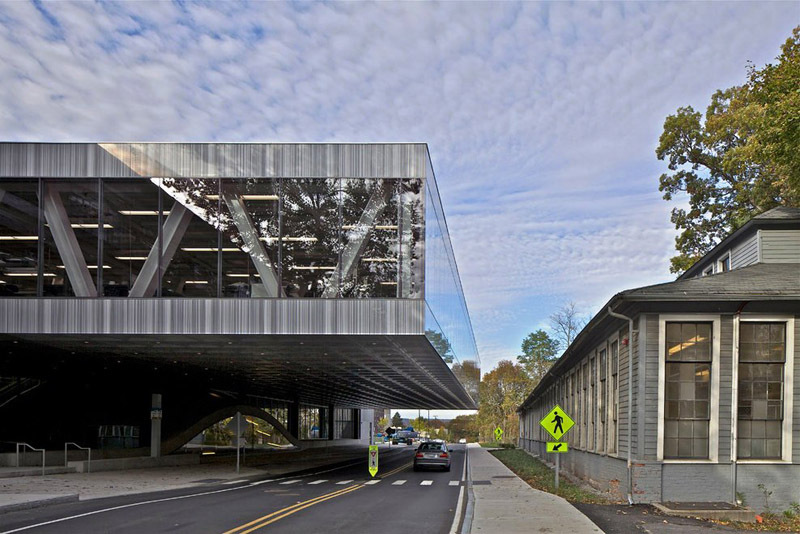 Exposed steel, floor-to ceiling glass and concrete are robust and economical. The Green roof of Milstein Hall is considered another façade of the building, reinforcing the concept of the building as a connector. 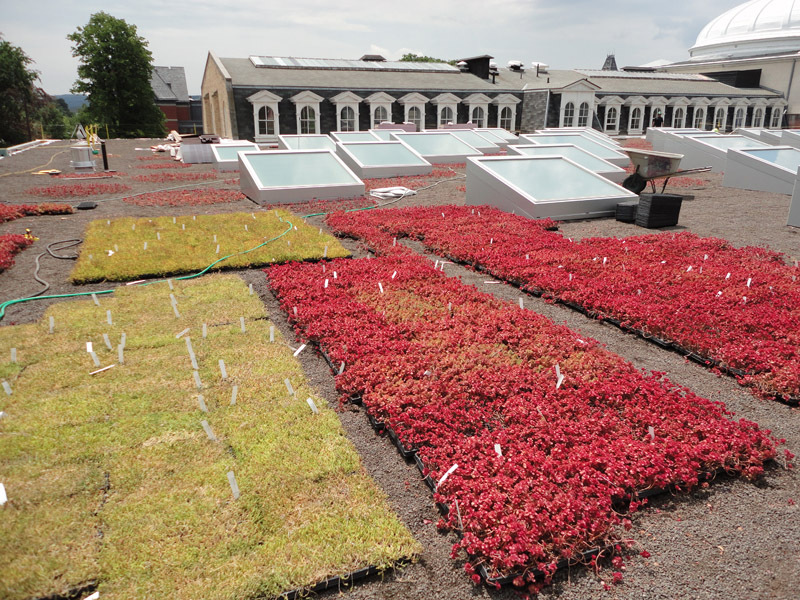 The entire roof, with the exception of the skylights, is vegetated in a graphic pattern of two types of sedum plantings. The sedum “circles” gradually increase in diameter as they approach the gorge, creating a landscape that is orderly and structured nearest the Arts Quad, and a denser, less structured field as it reaches the gorge. 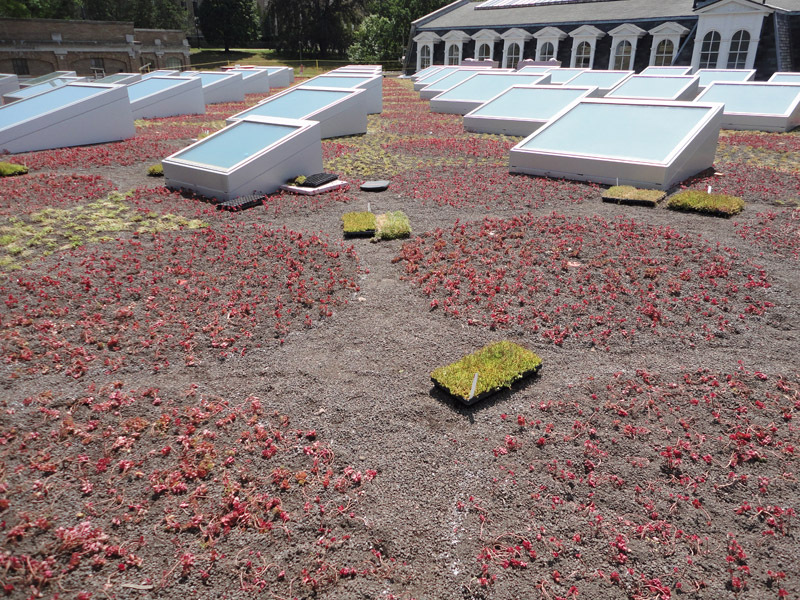 Given the visibility of the roof top from the third floor of Sibley Hall, and from Rand Hall and Baker Laboratory to the east, a vegetated roof creates a varied, living landscape far more appealing plus the vegetated roof will absorb water and channel it to existing storm water systems. Three sizes of skylights are arranged in a radial pattern on the roof with the larger ones in the center and the smaller ones toward the perimeter of the building. This creates consistent natural light levels across the entire second floor studio space. These skylights and glass walls cover 57% of the vertical exterior surface area to maximize natural lighting in the classrooms and studios. 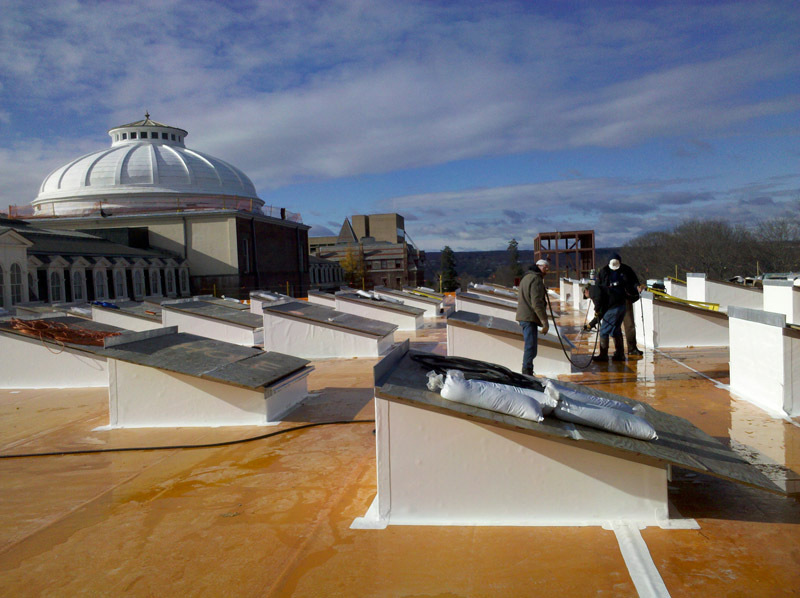 The Charles F. Evans Company, Inc. experienced teams installed the waterproofing system, insulation and drainage layers. The concrete roof deck was primed with Surface Conditioner 150 prior the installation of the Sarnafil G-476 self-adhered membrane. Then teams loose laid the NWP separation layer over the G-476 membrane and loose laid 6" of extruded insulation. Then the installation of ZinCo Floradrain FD 25-E Drainage Panels were performed along with the installation of a ZinCo Filter Sheet SF. Finally the installation of growth medium and plantings were performed by others. 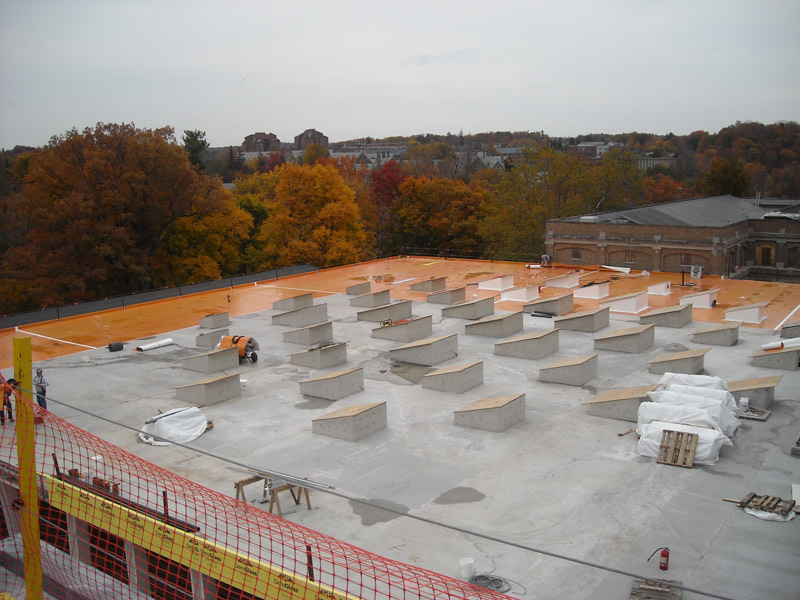 The Charles F. Evans Company, Inc. was excited to learn the roof system of choice for Paul Milstein Hall was a Sika Sarnafil product. “We have a log relationship with Sika Sarnafil and we truly appreciate the education and support they give us on all projects”, said Bob Pringle, Vice President of the parent company Evans Roofing Company, Inc. The project teams and site employees appreciate the field support and hands-on training provided by Sika Sarnafil’s experienced personnel. 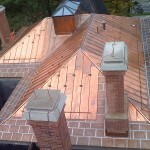 Safety was critical on this fast-track project due to the full time students on campus. 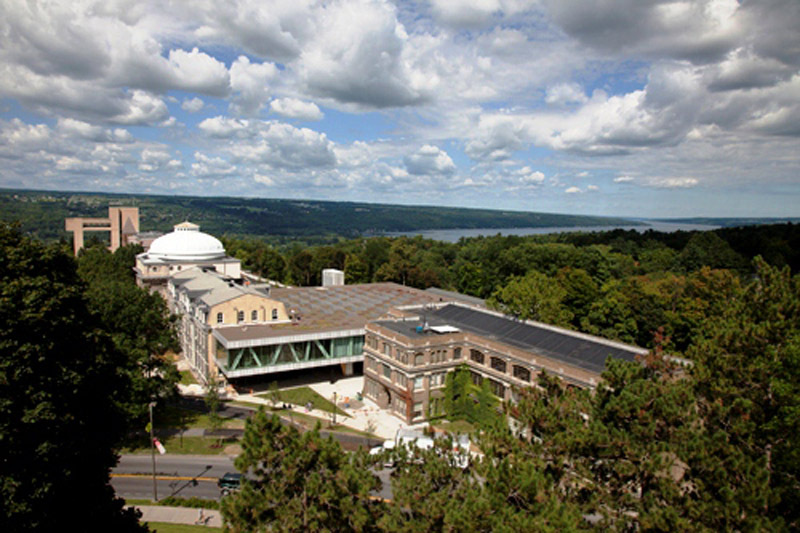 Cornell has approximately 28,000 students with all surrounding educational building in full operation so the safety of these students and faculty was first and foremost. The General Contractor on this project was Welliver Construction, Inc., a company Charles F. Evans Company, Inc. has a long history with completing a multitude of complicated projects. “Cornell University has a rigorous safety program on campus only hiring the best contractors through a comprehensive pre-qualification process so all trades involved with this project should be recognized for their safety efforts”, said Bob Pringle. Specific project safety training is required before any worker is allowed to enter the project. One hundred percent fall protection was required on this project, which made this project a personal commitment from all workers. 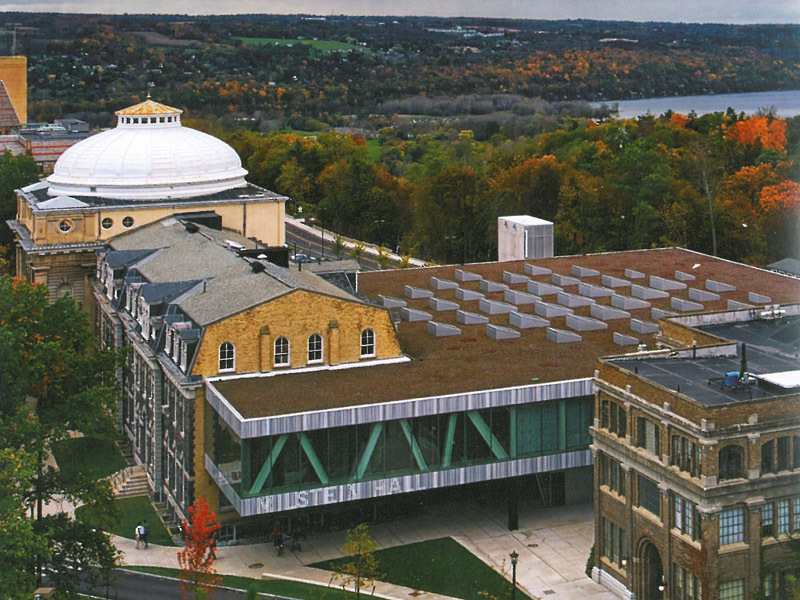 Cornell University’s Environmental Safety and Health Department worked regularly with Welliver Construction and all trades to enhance the project safety. Frequent inspections of the project were performed to ensure workers worked safely in accordance with OSHA’s regulations. In addition, Charles F. Evans Company, Inc. enforced their safety and health program with weekly safety inspections from their corporate EH&S Department and their insurance company’s risk management department. “Project safety is not only keeping workers safe but as important the pedestrians on campus,” said Michael Roden, corporate risk specialist for the parent company Evans Roofing Company, Inc.